The last album I got just because of the name. This time around I knew this was some good stuff, but I wasn't sure if it was gonna change up, or get all poppy or abstract or what. As it turns out, it's more of the almost exact same, including a few redos of songs on Falling Through A Field. 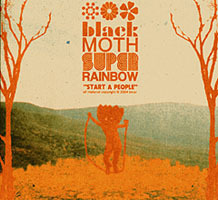 That's not a bad thing, because as I noted before, Black Moth Super Rainbow (yeah, I know) has a sound unlike any other. This guy's love of analog synths, old-style drum machines, and voice filters knows no bounds and it shows. It's like Boards of Canada squared, or cubed, or times pi. The gardeny fetish is still around - "Vietcaterpillar" makes a return along with other green-sounding sounds like "Seeds" and "Snail Garden." It's still basement-y and lo-fi, but I think it has better production this time around - the new "Vietcaterpillar" and other songs have more presence, more bass, a chunkier sound. Maybe he just turned the volume up, but it sounds good. Like the previous album, the beats are pretty simple and the tone is homogenous, but it's not such a big deal because nothing else sounds like this. If an indie rock band is simple and homogenous, well, they're out because there are other people playing guitars. But BMSR is in a league of its own soundwise, so if you complain, all you have to compare it to is itself. In any case, it's interesting and unique-sounding electro-analog music bites, so you should check it out. 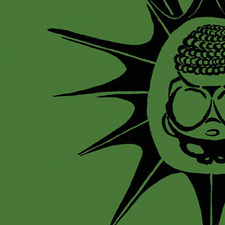 Here's "Vietcaterpillar" by Black Moth Super Rainbow. Yeah, it's good. Man, if you want more, get the album! Or go to the old review. Sorry I've been remiss in updating. I've been both sick as a dog and working like one, and trying to organize about a million other things as well. Not to mention I'm over my space and bandwidth limits by a fair amount... but don't you worry about me! Anyway, soon you'll have more updates. Besides, it's a celebration! Just had my 30,000th visitor. Now isn't that something? 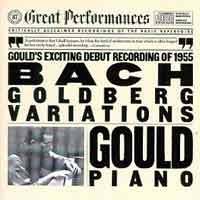 A while ago I took a class on Bach, and decided I wanted to seek out a copy of Glenn Gould's famous 1955 performance of Bach's Goldberg Variations. If you haven't heard of them, they are a set of piano pieces based around a theme, very pleasant and complicated, and Gould's 1955 version was a kind of landmark recording, as he plays with such incredible skill and precision, although he also hums along occasionally and frequently plays the songs so fast that it makes you blink. I couldn't find a legitimate and complete CD of the 1955 session, so I had to look online and found a copy in an obscure whole-album file format, which I had to split and re-encode, but now I have it! And it sounds great. I'm no music theorist, no classical aficionado, so I'm not qualified to recommend this on any other grounds than that I like it and it's interesting to listen to. I like Bach, and this is an excellent recording of an excellent set of pieces by him, and that's enough for me. I'm providing the famous aria and variations 12 and 20, just because I feel like it. 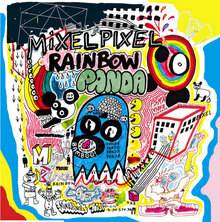 Shortly after I started listening to the Unicorns, I heard about these guys and went for the bait - how can you resist an album called Rainbow Panda, with Bert and Ernie and Pac-Man stuff on the cover (click it)? I was quite pleased to find that it was a great album, similar to the Unicorns' in many ways, and like that album perhaps a little silly for some people. Like the Unicorns, the members of Mixel Pixel seem to see nothing wrong with having weirdness and goofy lyrics share the stage with great musicianship. While the Unicorns went at it with a keyboard and kinetic guitar, Mixel Pixel seems to lean more heavily on electronics, though not to a fault - they simply have a few more saw waves and midi instruments coursing through their songs. The retro arcade sound is not unlike the Telescopes, but the songcraft is more like a slightly chilled out Unicorns, and Mixel Pixel ends up comfortably between them without sounding derivative. There is a nice variety of sounds on the album, though most do walk that line between electronic and instrument-based music. "Pink Shirts" kicks it off with a great, tinny beat and sci-fi keyboards, while a chunky guitar backs up the cheeky vocals ("I like pink shirts/ with the lacy cuts/ I like the way she flirts/ I like the way she struts") and the song eventually disappears into a sort of acid twist of analog noise. "My Animal" follows, with a hot beat and screeching guitar alternating with a wonderfully harmonious chorus featuring a casio harp. "Psych Mo-fo" is one of the more 80s-arcade feeling songs on the album, but it's a real winner - the singer's heavily filtered voice sounds more like a guitar than the actual guitar does, and the constant Asteroids-fire noise is just percussive enough to not be bothersome. The instrumental break 1/3 of the way through is just fantastic, it should be my theme song when I bust the top score on Ms.Pac-Man at Round Table Pizza. The last song, "Body Automatic," is a great one too, I find myself humming the chorus still. While the other tracks don't distinguish themselves quite as much as the ones I've mentioned, there are definitely other great tracks to discover and love. Basically, fans of hot lap pop and quirky stuff like the Unicorns should really check this album out. It's got a great retro sound that goes well at those Atari parties, and who can disagree when they sing things like "Live like the bees, in colonies, under the stars, pollinate the bars where the people and kittens are..." Plus, props to the cover artist, it's definitely filthy and partly because it looks like it accumulated on the back of a Trapper Keeper during 7th grade. Here's "Pink Shirts" and here's "Psych Mo-fo" by Mixel Pixel. 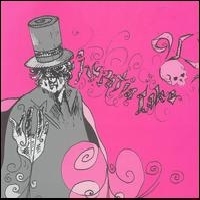 (republished due to glitch) I heard about Hypatia Lake when this album (their second) came out, from several sources, and it went straight to my medium-priority "find when you've got the time" list. Now that I have it (a month later) I wish I'd gotten it much sooner - it deserved to go straight to the bottom of the list, where I put everything important and wonderful. I wasn't really sure what I was getting into and the amount of reverb on the introductory track made me check if this was indeed the indie-tastic band I thought it was. The next song, the first proper song on the album, convinced me that I was in for a treat. Like other indie-type bands, it's hard to describe the album with words but once you hear it you know it has an original sound. I'd be pretty hard pressed to find any reference points for you, but I guess it kind of strikes me as Black Heart Procession-y but less anachronistic sounding and more complex, or a less whimsical Sufjan Stevens. That's probably way off. Fortunately, the music speaks for itself. There's a solidity, a wholeness to the album that makes it feel like a solo project, but it could be that the band is just really good and there's no infighting over who gets to be high in the mix and what sounds best - it just seems to go for it, and the confidence with which the music is played overtakes any shortcomings (like the singer warbling, "doo wop, la la" in the background of "Fishies vs. Lines." The songs change over their course but aren't hyperactive, and know when to stay in something good, or just tease you with it. There is a concept (it's about a guy in a fictional town established in their debut), but like the best concept albums, it guides the music without limiting it, and anyway as concepts go this one is pretty loose. Here's "The Paradigm of the Introvert..." and "He Could Not Save Her From the Cold Blade in the Pale Moonlight" ... wow, I guess this band does have a downside, the length of their freakin song names. Worse than Red Sparowes. Well, maybe not.